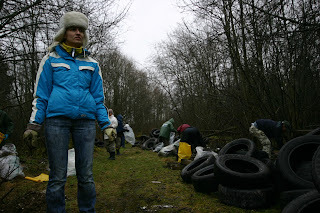 Lithuania has declared war on both its garbage and Estonia. Reasoning that if Lithuania is three times larger than Estonia—and fearing that its northern neighbor might clinch a Guinness record—Lithuanians have decided to collect three times more garbage (30,000 tons) than the Estonians. All on the very same day. In few weeks, Lithuanians have assembled a team of thousands of volunteers— Estonians have right now close to 20,000 volunteers. "We welcome the Lithuanians," said Rainer Nõlvak, one of the leaders of Estonia's civic initiative. "But they're going to have to demonstrate amazing organizational abilities to catch us." Estonia's civic initiative, Teeme Ära 2008, has been half a year in its planning. The clean-up day in both countries is May 3rd. Estonian organizers believe 40,000 volunteers are needed to clean up its mapped waste, but they have recruited close to 20,000 at the moment. "We'll get all 40,000," said Nõlvak. "We are registering more than a thousand every day." Recruitment ends at the end of April. War on Garbage, the tiny Republic of Estonia doesn't seem to be giving ground.